Exclusive Interview: One-on-One with “Hip Hop’s Financial Advisor” — D.R.E.A.M. We recently got a chance to chat with the acclaimed financial advisor and creator of the March Money Madness game (an online stock picking competition that takes place during the month of March), Rob Wilson. Wilson has been featured in Black Enterprise as an “All Star” financial advisor, and advises some pretty cool clients from professional football athletes like Superbowl Champion Hakeem Nicks to high-profile entertainers like Tyga and Ryan Leslie. Rob is a good friend to D.R.E.A.M. and a huge proponent of financial literacy. Check out our exclusive interview with “Hip Hop’s Financial Advisor”! Health and wealth are two of the most important life skills, yet they are the lease covered topics in schools. Financial literacy is important because financial security is important to the happiness of your life. We need to understand how the system works in order to get the most out of it and not be taken advantage of. The Great Recession was caused, in part, by financial firms taking advantage of financially unsay people. What are some suggestions you have for teens and young adults trying to get on the right financial path? Read. Reading business and financial publications, websites, etc. will help young people understand what the important financial issues are in world. Start saving. Get in the habit of saving money, no matter how much you have money you have currently. Getting in the habit of saving is more important than the actual dollar figure that you start with. What advice would you offer to an aspiring entrepreneur? Get started. Most successful entrepreneurs say that if you are not a little embarrassed at your first try at a business, you've probably waited too long to start it. Your business will not be perfect from the beginning. But, getting started & incorporating feedback from customers will help you get better and will set you apart from others that are afraid to get there business out there. The saying goes "You don't have to be great to get started, but you do have to start in order to be great." How do you celebrate National Financial Literacy Month? I conduct seminars and events to educate as many people as possible. In addition, I will have a lot of fresh content on my website http://www.robwilson.tv and my YouTube channel http://www.youtube.com/robwilsontv that people can learn from. 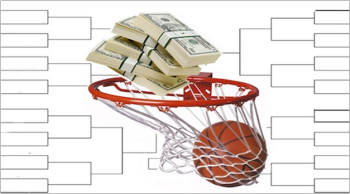 What was catalyst to "March Money Madness" and how do you see it evolving in the future? Finance isn't the most interesting topic to most people, so I created MMM as a way to use people's interest in sports to teach them about finance and investing. I am going to take this concept and apply it to other popular sports as well. Hopefully that will allow us to educate even more people. Who is your favorite figure in financial literacy history and why? I am a fan of Suze Orman and Dave Ramsey. I appreciate the work they have done to teach people how to handle their financial issues. I plan to follow in their footsteps! When a successful music producer based in Columbus, Ohio hit the jackpot by winning the Ohio Lottery Mega Millions game, who did he call? Rob Wilson. Rob Wilson, a Pittsburgh native, is a Vice President and financial advisor with Blazer Capital Management in Pittsburgh where he concentrates his practice on providing advice to and managing financial affairs for successful professional athletes and entertainers. His work providing advice and guidance to these prominent young stars has earned him the moniker “Hip Hop’s Financial Advisor.” Rob also received his MBA from Carnegie Mellon University’s Tepper School of Business. Rob shares his advice as a frequent contributor to the KDKA TV morning news, and his appearances can be seen on his website at www.robwilson.tv. You can also connect with Rob on twitter (@RobWilsonTV) and YouTube.